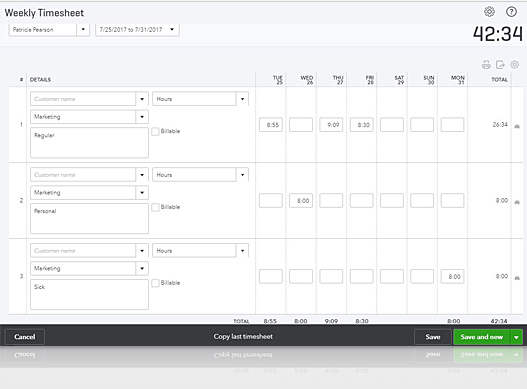 It is so easy to connect and synchronize employee time with QuickBooks Online (US and Canada Versions) and PayClock Online employee time clock software. 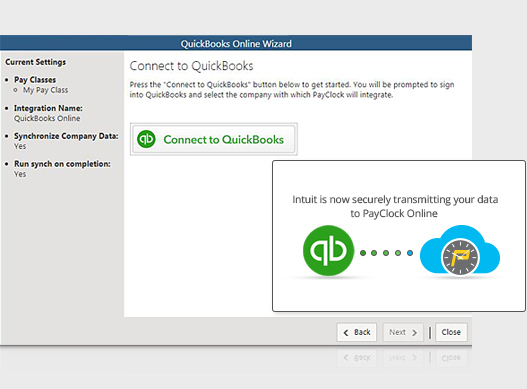 Using the QuickBooks Online Wizard built into PayClock Online you can synchronize employee timesheets and company data both ways between your QuickBooks Online and PayClock Online software. Now you can securely and seamlessly integrate recorded employee time, pay codes*, and employee classes into QuickBooks for easy payroll processing. *(Hours by pay code are displayed as seperate lines on QBO time sheets, but are always transferred as regular hours due to QBO restrictions. Non-regular hours must be manually adjusted). 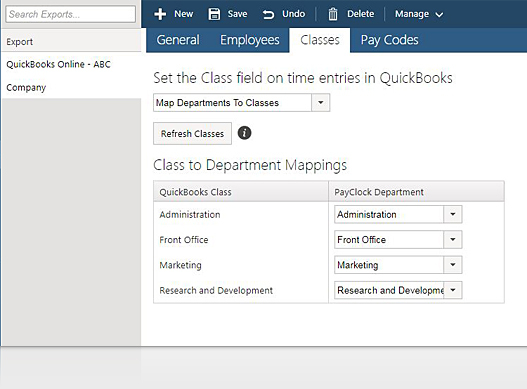 PayClock Online's easy to use wizard let's you map your QuickBooks Online employee classes to match the department of employee's recording their time in PayClock Online. PayClock Online's pay codes* display directly within QuickBooks employee timesheet entries for better reporting and calculation of payroll. 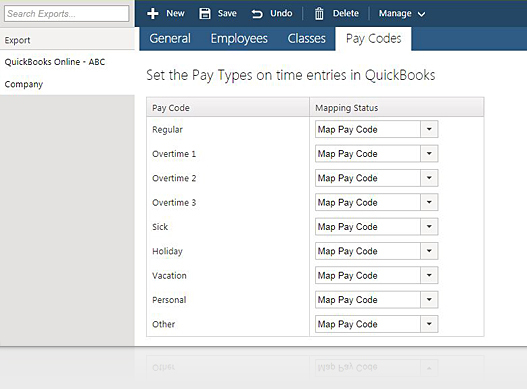 Pay period timesheet entries automatically appear in QuickBooks Online with the correct payroll class and descriptions of pay code types for each employee's recorded time. *(Hours by pay code are displayed as seperate lines on QBO time sheets, but are always transferred as regular hours due to QBO restrictions. Non-regular hours must be manually adjusted). PayClock Online makes it easy to record, edit and report your employees’ hours. 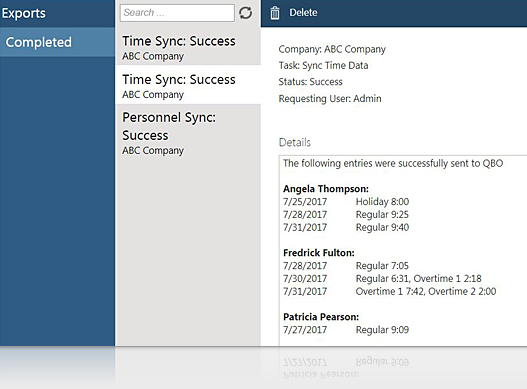 When you make changes and edits to employee timesheets in PayClock Online at anytime during the pay period those changes automatically synch and update the employee timesheets in QuickBooks Online. You never have enter employee data twice. 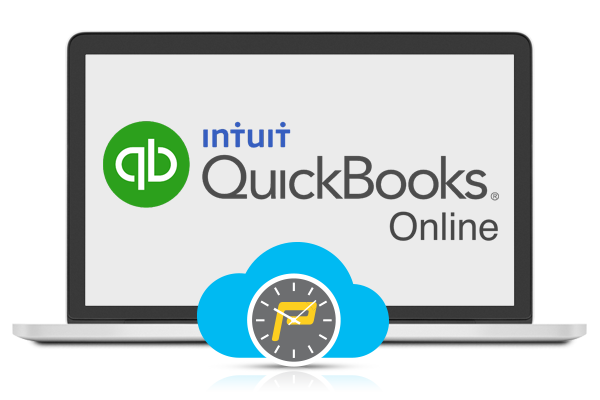 Add new employees or updated existing employee information in QuickBooks Online and the changes update automatically in PayClock Online. True synchronicity between PayClock Online and QuickBooks Online makes processing employee hours at payroll time a breeze!